So not sure if the order is still the same. 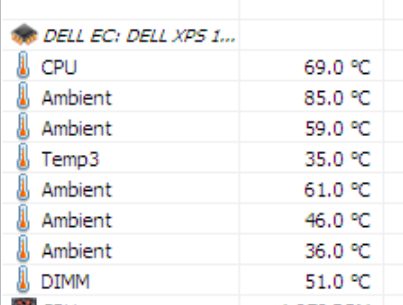 Yes, that's certainly due to a BIOS update as the BIOS is responsible for providing the sensor values. If you attach the HWiNFO Debug File I will have a look at that. (11-15-2018, 10:33 PM)Martin Wrote: Yes, that's certainly due to a BIOS update as the BIOS is responsible for providing the sensor values. Well, indeed. It looks like the last BIOS doesn't provide information about temperature meanings anymore. Hmpf... I will ask at Dell then about this, but I doubt they are interested in changing this back. I also noticed the SMART information says "Drive Temperature" and "Drive Temperature 2", is this also due to the Bios/EC, or is this always named like that or by the specific drive? I too doubt they will change that or provide some clarification. The interface used to provide these values is very secret. Drive Temperature is independent from that. 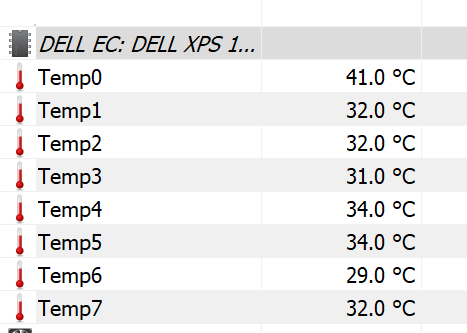 If it's a NVMe drive, the first value is most probably the media a second the controller temperature. So far I had no luck with Dell at all, after months dealing with their support. I wonder why they decided to change that and whether there's a different way to retrieve the information (sensors labels are displayed correctly in the diagnostic tool provided by Dell). I don't know why they did it. It's quite possible there's some new function to retrieve this information. I have requested information about these functions some time ago and even though I have an NDA with them and good contacts, my request was denied. This is really bad news and reason to avoide Dell actually, because yeah, that is the Dell I learned to love. Current time: 04-25-2019, 09:02 PM Powered By MyBB, © 2002-2019 MyBB Group.